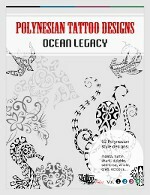 Unpacking the five main Polynesian styles: Samoan, Marquesan, Tahitian, Hawaiian, Maori. 206 pages, 550+ illustrations, 400+ symbols and variants. 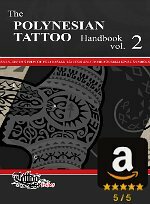 While we suggest Volume 1 as a comprehensive introduction to the world of Polynesian tattoos, Volume 2 is an unprecedented resource for those who wish to take one step further and delve deeper into the styles, elements, and meanings of this art." Buy it here and get the EPUB for FREE! 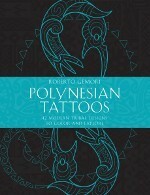 Learn to know Polynesian tattoos and their symbolism. 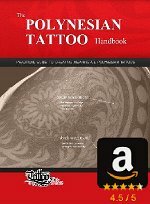 250+ pages with symbols, their meanings, their placement on the body, case studies and step by step tattoo creation, basic elements and reusable designs. TT design books: this A4 sized print book collects all 93 designs from design books number 1+2+3+4, each one accompanied by its stencil. 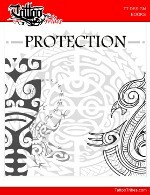 Polynesian tattoos often include protection symbols. 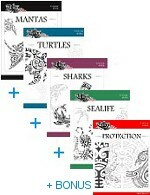 This BONUS book contains 28 flash hi-res designs and outlines, each one with different characteristics and meanings. Just write your name and email and get it FREE! featuring 42 original tattoos, each one accompanied by a description of its meanings. Mantas are amazing animals usually associated to several different meanings, some depending on their nature and behaviour, some inherited from legends and stories. 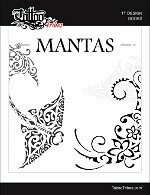 This book contains 20 unpublished flash designs of mantas along with their outlines, each one with different characteristics and meanings. The turtle, or honu, is an important creature throughout all Polynesian cultures and has been associated to several meanings like health, fertility, long life, family. 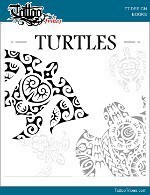 Second book of the series, it contains 20 unpublished flash designs of turtles along with their outlines, each one with different characteristics and meanings. Sharks symbolize protection, guidance, strength, fierceness and the warrior, but also adaptability and sociality. 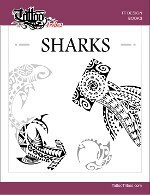 Third book of the series, it contains 25 unpublished flash designs of sharks along with their outlines, each one with different characteristics and meanings. Protector spirits, called aumakua in Hawaiian traditions, often appear disguised as birds or sea creatures. 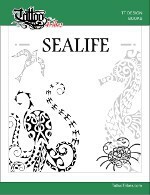 Fourth book of the series, it contains 28 unpublished flash designs of sea creatures and birds with outlines, each one with different characteristics and meanings. Get the 5 of them and pay just 3! 93 original unpublished designs + 28 bonus ones, each one in hi-res with its outline. All designs are in vector format and will remain crisp and neat at ANY size. * Price in US dollars. To know the up to date cost in different currencies you can check this link.